Jasmine and Justin were one of our couples that knew right away that Keswick Vineyards was the venue for them as soon as they got engaged. Keswick Vineyards was their dream wedding venue, so they were determined to do whatever they could to have their wedding here. They drove all the way from Virginia Beach after a long day of work, and, once seeing Keswick Vineyards, they decided to book on the spot. After this moment, we couldn’t wait to see what other surprises Jasmine and Justin had in store for us! In the wedding industry, you see so many new ideas and traditions that you’ve never even seen or heard of before. From the burying of the bourbon (which Jasmine and Justin did to stray away rain), to the blending of the sand—you really see everything! The most meaningful and touching ideas that we see incorporated in weddings, though, are ones that have been passed down for generations. Jasmine and Justin’s wedding on September 29, 2018 was one where we adored all the traditions and rituals, particularly during the ceremony. 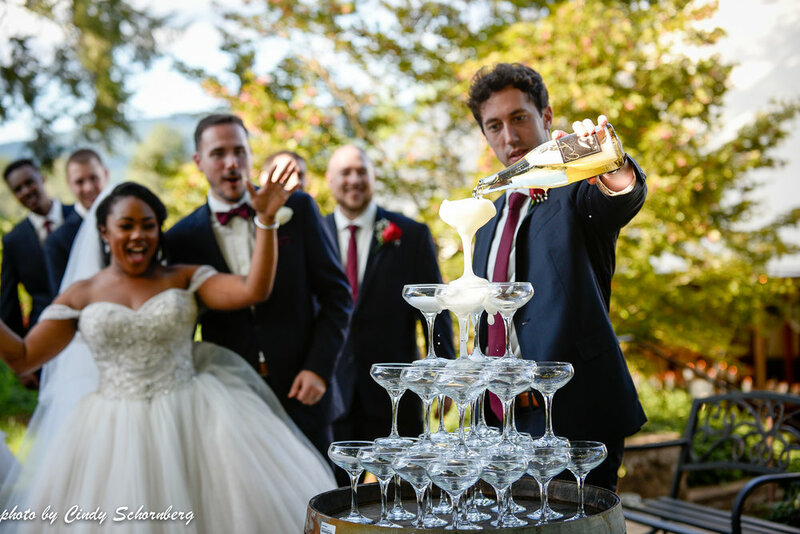 A fun idea that we’ve seen at previous weddings is the “blending of the wine” during the ceremony. With getting married at a vineyard, couples have to incorporate some part of the “vineyard” feel to their wedding! Jasmine and Justin used our award-winning wine—one red and one white— and poured each of their glasses into one singular glass of wine, creating a “blush” color that they both drank out of. The blending of the wine demonstrated their lives and their families that were now “one,” opposed to being two separate entities. A new tradition that we saw for Jasmine and Justin’s wedding was the “jumping of the broom.” The “jumping of the broom” is an African-American heritage, which symbolizes the joining of two families, as well as, respect for those that came before them and “paved the way” for future couples getting married. During the tradition, Jasmine’s mother, Theresa, swept circles around the couple and then placed the broom directly in front of them. After Jasmine and Justin were pronounced husband and wife, everyone chanted “one, two three,” and they jumped over the broom. We thought that it was such a fun tradition that was so meaningful to the couple and was also a fun experience for everyone to watch. As Jasmine and Justin walked down the aisle, everyone threw lavender for the joyous celebration! Felicitations, Jasmine and Justin! We hope that you enjoyed every part of your “dream wedding” at Keswick Vineyards! Event Planner: Keswick Vineyards, Caterer: L’etoile, Photographer: Sarah Goodwin, DJ: Craig Mangrum, Officiant: Julie Trump, Desserts: Hummingbird Macaroons, Musicians: Meladicious String Quartet, Hair and Makeup: Brittney Brown and Bella Donna, Florist: Designs by TAB, Rentals: MS Events, Lighting: Skyline Tent Company, Painter: Art by Alee.